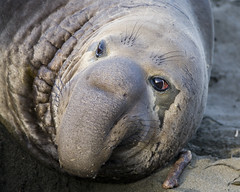 The Elephant Seals at Piedras Blancas are worth visiting! Originally uploaded by Rune T.
A registered Flickr user can join Scoopt, tag their news worthy images with the keyword “scoopt,” and email Scoopt notifying them of the postings. For images that end up being distributed to media outlets, the Flickr user and Scoopt split profits 50/50, according to the company website. The Flickr user retains primary copyrights, and Scoopt has a sub-license to the image, according to the site. In addition, Flickr users can make a little profit for recommending friends to Scoopt. The Flickr user will get a 10 percent cut of friends’ images that are sold. Call them citizen journalists or paparazzi or photographers, Flickr users could be part the market for user-contributed news content.